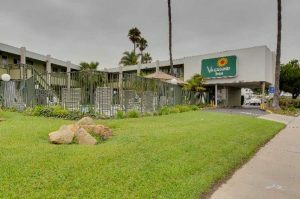 The Vagabond Inn San Diego Airport Marina is one of three Vagabond Inn hotels in San Diego. This one of our San Diego hotels is located on the America’s Cup Harbor at the entrance to Shelter Island in Point Loma, San Diego, CA. Walk a few steps to the famous Point Loma Seafood Market and the Sport Fishing/HM Landing. Our hotel in Point Loma is located only minutes from: San Diego Airport, Dog Beach, Sea World, the San Diego Sports Arena, the Cabrillo National Monument, Downtown, San Diego Gaslamp District, Balboa Park, the San Diego Zoo, Qualcomm Stadium, Petco Park, Coronado Island and various cruise ships. We serve a daily, complimentary continental breakfast and weekday newspaper. Swim a few laps in our heated pool or enjoy cable TV with HBO in your room. Kitchenettes are available for your added convenience. When you stay with us, we’ll serve you with our own brand of Western hospitality. Great value, friendly people – it’s how we do things.